The seasonally heated pool (late April through early October) is only steps away from the hotel’s bar, Jett’s Grill. The perfect way to spend a warm west Texas afternoon . 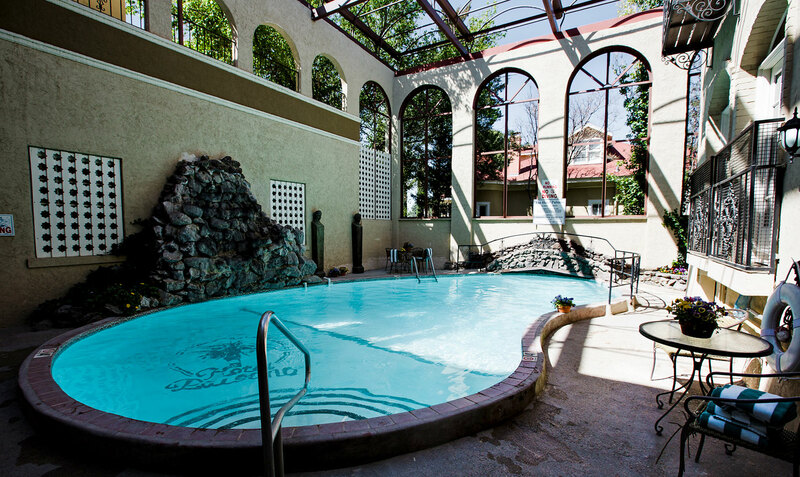 . . the Hotel Paisano’s kidney shaped pool was installed in the west patio in 1960. The pool is heated seasonally, May-October, and is only steps away from the hotel’s bar, Jett’s Grill. A soothing waterfall cascades over local rocks surrounded by colorful flowers and climbing ivy. Generously sized, absorbent towels are provided poolside daily. Relax and enjoy the view of the wide desert sky. Pool hours are 9 a.m. to 9 p.m. Entrance via the hotel’s ballroom or the mezzanine hallway. No diving, please. No lifeguard on duty. Beverages may be served in non-glass containers only. No food, glass or pets allowed in the pool area.